his past week has been a humbling and healing time, which, in time, I will write about, but is part of my delay in writing this review for the blog tour (this was due last week). 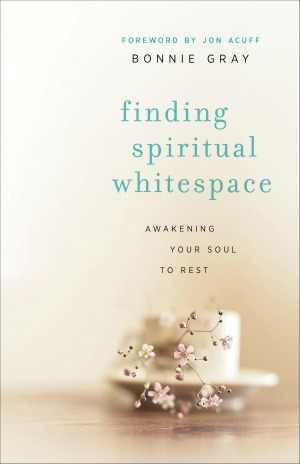 I was reading this book throughout some major home renovations and heart renovations, making this an especially wonderful God-ordained time to read, Finding Spiritual Whitespace: Awakening Your Soul to Rest by Bonnie Gray. I’d like to encourage you to click that link and not even read any further. Order the book now! It’s that good. There’s hardly a page in my book without a marking on it. And, I can see it as one for anyone, where ever you may be with God. It was written from a broken heart in such a personal way that can touch a heart very personally, like it did mine. Perfect peace from God isn’t found by forgetting. Peace is ours if we dare to remember our pain and our sorrow, and experience our fears fully with Jesus. Shalom peace from God is a putting back together. Shalom is the movement to recover pieces of ourselves that have been abandoned, a putting back together of what we’ve left behind, to find Jesus with us in our memories. ….Shalom peace is now my place of faith. My journey to find rest is now a journey toward wholeness. A putting back together that includes broken pieces. The journey of rest is leading me to recover all of my soul. This peace makes no detours around reality. Bonnie and I could easily understand together how “[b]ehind every pain lies a lost dream” and how we need to allow Jesus to repair the nets of our dreams we’ve left behind and allow God to fill them full, and overflowing. I imagine there will always be the knots in nets that have torn, but we can find the beauty even from those snarls and snags in our lives. very April 23 since 1995, people all over the world gather to promote and celebrate the joys of reading and writing literature. This is World Book Day, a yearly event organized and promoted by UNESCO to encourage reading for pleasure around the world. Though people of all ages are encouraged to participate, World Book Day is geared especially towards children and young people, encouraging them to develop a good relationship with books and good reading habits that they will then carry into adulthood. The date of April 23 was chosen because it coincides with several important dates in literary history. William Shakespeare was born on April 23 in 1564, and he died on the same date half a century later in 1616. April 23 is also the anniversary of the Miguel de Cervantes and Garcilaso de la Vega, a 17th century Spanish writer who also served as a chronicler of Spanish presence in Peru. The French novelist Maurice Duron, Colombian short story author Manuel Mejía Vallejo, and the Icelandic poet and novelist Halldór Laxness were also all born on April 23. This makes the day uniquely suited to represent writers from all over the world. World Book Day was established in 1995. It is not an official holiday in any of the many countries in which it is celebrated, but it was conceived as a global initiative to be celebrated all around the world at the same time. UNESCO, the education and cultural outreach branch of the United Nations organized World Book Day. Each year, UNESCO chooses a city around the globe to serve as the World Book Capital City for that year. Madrid, Alexandria, New Deli, Montreal, Bagota, and Amsterdam are some of the cities chosen as past capitals. Capital Cities receive backing from UNESCO so they can put on more ambitious events. World Book Day events are generally left open for libraries, schools, and community organizations to put together themselves. Book fairs are common, as are costume contests where children dress as their favorite literary characters. A few cities host more ambitious annual events to celebrate their own literary traditions. In Spain, many cities organize public “readathons” of the full text of Miguel de Cervantes’ Don Quixote. This is an ambitious undertaking, as the full text of the novel takes around two days of continual reading to complete. The Don Quixote Prize for Spanish literature is also awarded on this day. Similarly, pubs and other public spots in Ireland hold readings of James Joyce’s Ulysses, and people organize Ulysses tours, where participants visit all the locations around Dublin that are mentioned in the novel. In the United Kingdom, World Book Day is celebrated with the publication of a series of £1 books for children. These inexpensive books include many of the most popular titles for kids and make booksets for classrooms more easily accessible for schoolchildren in the country. With so many distractions in modern life, it is easy to forget the pleasure of immersing yourself in a good book. World Book Day serves as an important reminder of the joy of reading. Why Read to a Baby? arents are excited and proud when their baby learns to say a few words. From infancy onward, of course, the baby has been listening and learning language. The skill of saying the words aloud is just the tip of the iceberg. Inside their developing brains, babies are ripe for knowledge. They soak up everything that they see and hear. Reading books to them can enrich their knowledge and lay the foundation for a richer vocabulary at an early age. Reading to an infant may seem silly, but they love the sound of your voice and they are learning the nuances of language. By reading to them from all sorts of sources, parents can create an atmosphere of learning. As they get old enough to see pictures, then the real interaction between language and visual cues really begins. 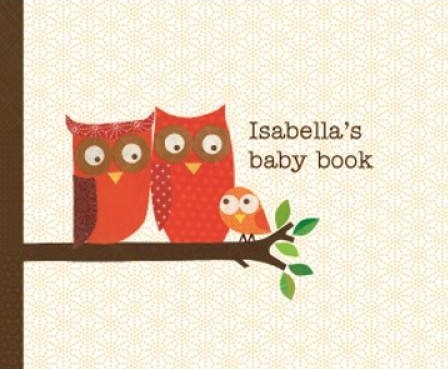 Personalized baby books can deliver a one-two punch of learning. One of the first words that a baby recognizes is the baby’s own name. After all, it is usually said again and again by the parents. If it is said in a book, then the baby becomes more alert to the text that the parent or grandparent is reading. This provides both enjoyment and education at the same time. An enriched vocabulary helps babies to understand the world faster. Reading books aloud is an important and loving aspect of good parenting. am getting an accumulation of books, and I have to thin my bookshelves some. 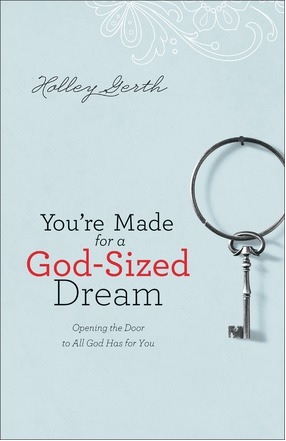 So, for this first giveaway, now through Friday, April 26, 2013 (ends 10 pm), I am giving away a copy of Holley Gerth‘s newest book, You’re Made for a God-Sized Dream: Opening the Door to All God Has for You . If you want an extra entry, share the entry that is on my FB page about this giveaway on your FB page and leave an additional comment that you did this. Be sure to again, leave a comment on my Writing Canvas Facebook page that you did this, to get counted for the entry! 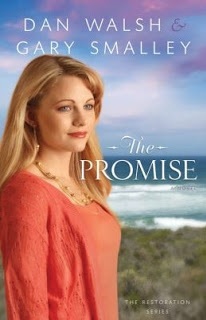 If this goes well, I will have more book giveaways in the near future! ith finally getting into more of a routine after our daughter’s wedding, I am looking forward to making more homemade warm comfort foods. 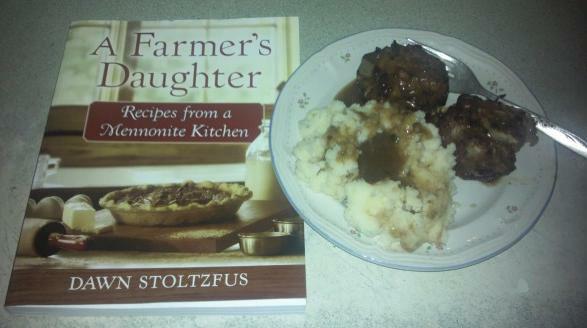 I was given the book, A Farmer’s Daughter: Recipes from a Mennonite Kitchen by Dawn Stoltzfus to review, and it certainly is one I will be using a lot, especially through the fall and winter months. I love making bread and the recipes look wonderful, even for Thanksgiving, such as, Fresh Apple Walnut Bread with Maple Drizzle or Honey Corn Bread. There’s numerous breakfast recipes that would be great for Thanksgiving or Christmas morning and many yummy soup recipes, one my married daughter even wants to try. Preheat oven to 35o°F. Mix together ground beef, egg, cheese, milk, onion, and salt. Shape into 8 mini loaves, place in greased 9 x 13 pan. In a small bowl, combine ketchup, brown sugar, and mustard; spoon evenly over loaves. Bake uncovered for 45 minutes or until meat is no longer pink. Serves 4-5. This will definitely be a recipe I will be using. What I like about meatloaf, is you can add additional things to it. If you have leftover rice . . . add it in! This was so easy to double and made 30 muffin sized loaves. I love it when the kids ask for more, and they certainly did! I look forward to trying out more recipes in A Farmer’s Daughter. If you are looking for a Christmas present, this would be an ideal one! 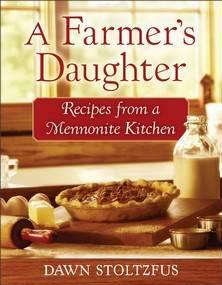 I received a copy of A Farmer’s Daughter: Recipes from a Mennonite Kitchen at no cost for the purpose of review. All opinions are my own and were not otherwise compensated. This book is now available from your favorite bookseller of Revell, a division of Baker Publishing Group.